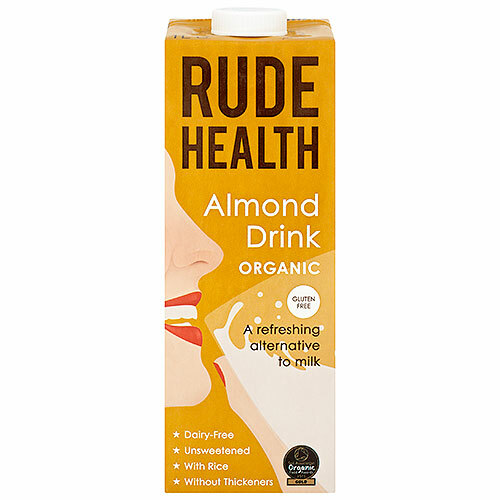 Creamy crushed almond is blended smoothly with rice, pure mountain spring water, and a dash of cold-pressed sunflower oil. Rice brings its own natural silky sweetness - so you won’t miss the usual thickeners, syrups or added sugars. It’s a naturally nutty almond milk. Use with cereals, add to coffee or tea, add to a smoothie or shake, or even bake with it, include it in your mashed potatoes or cook up a curry. Below are reviews of Rude Health Organic Almond Drink - 1 Litre by bodykind customers. If you have tried this product we'd love to hear what you think so please leave a review. Creamy crushed almond is blended smoothly with rice, pure mountain spring water, and a dash of cold-pressed sunflower oil.